Great handling, exacting build quality, and an interior that multitasks extremely well has made the Honda Fit Sport a darling of the automotive media since it debuted in North America in 2007. The car got a complete redesign in 2009, and for 2011, the Fit gets standard stability control, keyless entry, cruise control, and iPod integration, but it maintains the core attributes the automotive press (and buyers) love. Before this review, I’d spent little time with the small Honda hatchback. But after a full week with the Fit, I can see why the car earns so much praise. It’s an impressive overall package, but does come at a slightly steeper price compared to some of its competitors. 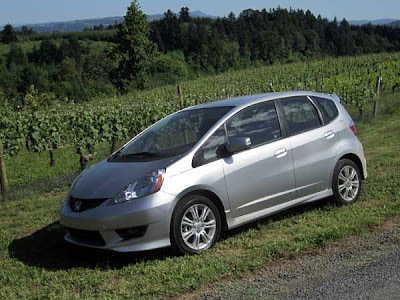 The Fit Sport’s exterior is indeed sporting thanks to its aero kit, 16” alloy wheels, and steeply raked windshield. It creates a distinctive look allowing it to stand out in the growing small car class. The Sport package also includes exterior amenities such as fog lamps and a rear spoiler. I thought the Alabaster Silver Metallic paint was a great color for the car. While the Fit Sport’s exterior is great, the interior is the big story. The Fit is arguably one of the most versatile cars on the U.S. market, thanks in part to its “Magic Seats.” Like many other rear seats, they’ll fold 60/40 and can fold flat. But the Magic Seats allow the seatbacks remain upright while the bottoms will fold upward, allowing a large area on the floor behind the front seats. The seat bottoms also have storage inside of them. Fold the seats flat, and the cargo area is cavernous, since the floor is low and the ceiling is high—lots of room to pack vertically. 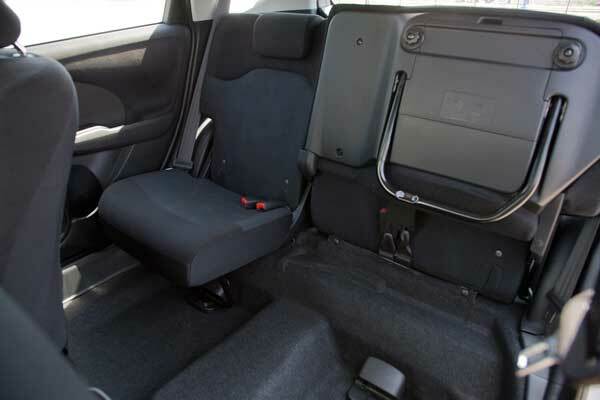 Even with the seats in the upright and locked position, there’s ample space behind the rear seats. Up front, there are two comfortable, well-bolstered sport seats. The dashboard features and array of organically styled shapes and plenty of places to put stuff, such as in the upper and lower passenger’s gloveboxes, and good-sized pockets in the doors. Very practical. 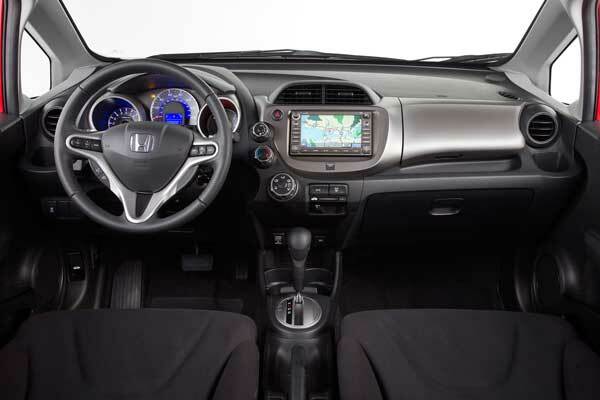 This Fit Sport with Navigation has the off-the-shelf Honda stereo/Navigation unit. I find the system clunky to use and the display looks like it’s out of a 16-bit video game. If you want to insert a CD, press a button, and a motorized screen folds open. I can’t help but wonder if that mechanized stereo/navigation unit will still work after 10 or 15 years. The good news is the six-speaker, 160 watt stereo is on par with other cars in its class, and it has controls on the wheel. The navigation has voice recognition as well, but no Bluetooth connectivity. The climate control system is operated using easy-to-use knobs—something I prefer over complicated push-button systems. Driving this Fit is a joy. 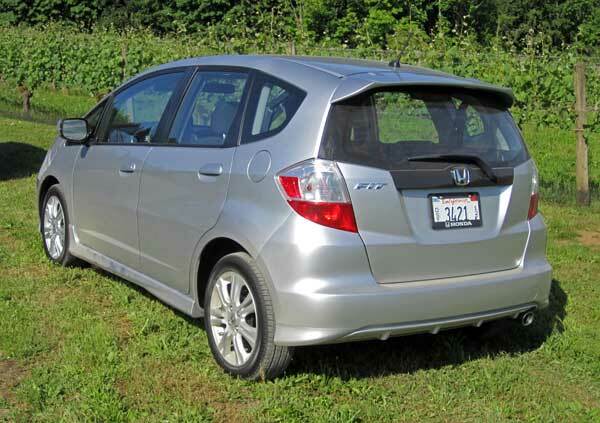 Although I prefer a manual transmission, the Fit’s five-speed automatic shifts quickly and smoothly. The wheel-mounted paddles let you change gears yourself, and they’re some of the best I’ve used in any car: There’s virtually no lag between the time you press the shift paddle and the time the transmission does the work. All Fits come with a 117 horsepower 1.6-liter SOHC engine with i-VTEC, Honda’s famous variable valve timing (and lift) feature. Power is ample, and throttle response is exceptional—even sports car like. The engine is nosier than I thought it’d be, but not intrusive. Fuel economy is rated at 27 city, 33 highway with either the five-speed automatic or manual transmission, which puts the Fit in the bottom half of the subcompact segment. The Fit Sport, which gets a rear stabilizer bar and bigger standard wheels and tires, is one of the best-handling subcompacts out there. Steering is quick, handling is precise with excellent weight, and grip is impressive, even with the fairly narrow 185/55/16 Bridgestone tires. The Fit is truly fun to drive, especially in the corners; handling precision is exemplary. Whether cruising or cornering, there were no rattles, squeaks, or vibrations to speak of. It feels rock solid—a typical Honda trait even in the company’s smallest cars. It definitely is a handler. Ten bucks shy of 20 grand is less than a hundred below a Focus SE hatch with sport package. I'd also be seriously tempted to downgrade to a base Fit with manual trans at $15,870 with destination; it seems that all you'd give up are the alloy wheels, a bodykit I'm not crazy about, the tech toys and about 16 months of car payments. You get the six speaker sound system, leather wrapped wheel, rear sway bar, too.